I can’t exactly remember how many years ago it was, let’s say more than 5 less than 12, but I will never forget the conversation between my neighbor’s husband and mine. Our children were little which meant, we all “lived” at the pediatrician’s office with some sort of funk. Upon my neighbors return from the Saturday Sick Clinic one day he eagerly explained to my husband that, “Salma Hayek was our doctor!” If having “Salma” as your doctor meant you were going to take the kids to the doctor, go, please, go take them! I’ll be at home sitting on the couch binge watching HGTV. I immediately knew who he was referring to and was hopeful that my husband would want to jump on the “Salma” bandwagon and take the kids to the Saturday sick clinic as needed. Who was I to explain that “Salma” is not there every Saturday, it was just her on call weekend, let the boys take their chances. Ta Da! Yes, my darling, his mom is a “doctor or something”, a pediatrician to be exact, and she has helped you and your sister out in the past. You go and have fun, but I’m still walking you to the door. Y’all, when I met Jake, I told Molly later that he looked like a young Keanu Reeves, she had to google Keanu…. and I got some more eye rolls. The Temple family is beautiful on the inside and out. Enjoy getting to know Ana Maria Temple and the adventure the Temple family has been living the past 14 months. Job: Integrative Pediatrician treating typical children’s issues using and combination of traditional and holistic approaches. When did y’all move to New Zealand? While we were traveling with the family in Australia, my husband had an epiphany. He had been trying to treat his doctor burnout with little success for the past 4-5 years. As we were sitting in the Outback, surrounded by the nicest, most laid back people, he decided that he needed to quit his job and try orthopedics in another environment, before quitting medicine all together. We picked New Zealand because we had heard numerous rumors that the Kiwis know how to balance work and life. We had never visited this beautiful land and it’s welcoming people. Lastly, the application process for the work visas was shorter than Australia. How was your living arrangement different from your home in Charlotte? In Charlotte we live in a house that is part of a neighborhood. In New Zealand we rented an apartment in the middle of the capital city, Wellington. This is a geographically small city with a big city feel, very safe, and very diverse. We walk everywhere for groceries, school, gym, restaurants. I bike to work. Our apartment overlooks a beautiful harbor on one side and spectacular hills on the opposite site. This is where the magic is. We are part of a major teaching hospital system, however it has the feel of a small community hospital. Both John and I work here. He has clinics in the mornings and operates in afternoons. He always has 1 day off a week, no call, no weekends, no holiday coverage. The pace of clinics and operating rooms is much slower than the US. This has been a huge change from his previous practice. I am a hospitalist with clinic requirements. Pediatrics here means everything. Thus, aside from caring for hospitalized children, I take care of thyroid disease, allergy testing, chronic headaches, eczema, ADHD, seizures, obesity, anxiety, you name it. I am a chronic disease specialist. There are no insurance issues because healthcare is government funded, and I have no time restrictions with my patients. A dream!! There is no rat race. Of course, this means that patients are waiting months to see the pediatric specialist, but that’s just what you do in a socialized medical system, you wait. Vacation expectations are 6 weeks, in addition to 2 weeks of education time. Everyone is expected to attend numerous conferences and present their findings. This creates a very open and inviting collegiate atmosphere. What is school life like for kids? Absolutely brilliant (my new Kiwi word). Schools here start at 8:50 or 9:00 AM. Kids have time to wake up at a decent hour, eat breakfast peacefully, and walk or scooter to school. The classrooms are surrounded by windows which are generally open and glass doors for maximum light. They all have Tea Time for 40-60min at 11 outside, lunch 1hr outside. There are no cafeterias. The kids eat outside on nice days and inside the classroom or under covered porches on bad days. School days end at 3:00-3:15pm with minimum homework. Many kids participate in sports at school. I can go on for pages on the wholesome child approach created by NZ education. All three children are thriving in this education environment. When do y’all arrive home? Are you returning to Charlotte Pediatric Clinic? No, I am no longer working with Charlotte Peds. My goal at this time is to practice concierge medicine in a truly integrative format. This means, that I will take insurance but there will be an annual fee. This fee provides patients with the opportunity to have visits that are longer than 10min duration, access to the practice for same day appointments, less wait on phone lines, less wait on forms and appointments, and email and phone contact with the doctor when needed. Over the past several years I have integrated a lot of holistic and functional approaches to my medical care. I am no longer satisfied with a medication solving the problem. I dig deep into the issues and search for the root cause of the issue. For example, if a patient has an asthma attack, I will treat them with Albuterol and other asthma medications as needed to prevent hospitalizations and death. However, once the patient is well, we will discuss why this is happening and what can we do to prevent this from persisting. What can we do to live a healthier life without meds. I do a lot of work with nutrition, the gut-brain connection, lifestyle medicine, and the human microbiome. My approach is evidence based, but my focus is preventing and treating chronic disease using food and lifestyle changes. A concierge type of practice will allow me to do well child visits, immunizations, sick appointments, and chronic illness appointments without the pressure of a clock or a hospital system. Because, I love teaching, I hope to continue to teach nutrition in the local schools as I have done previously. I aspire to hold seminars on non medicine approaches to ADHD, Eczema, Asthma, Anxiety, etc. To begin my education campaign right when I arrive in the US, I will be discussing The Rise in Teen Anxiety on Charlotte Today on Dec 22 and Healthy Habits for the New Year on Dec 29. Yes I do. 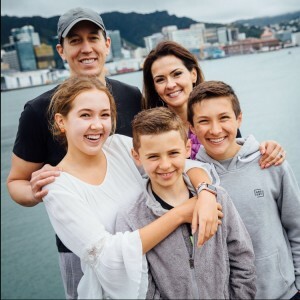 While living in New Zealand, I updated my website – www.familywellnesstips.com. I also redesigned my Instagram account @familywellnesstips with One Minute Pediatric Videos on various issues such as ADHD, Eczema, Headaches, Immune system. Who in your family is the most excited to return and why? Evan, my youngest, is missing a yard and neighborhood friends terribly. What will you miss there? The fresh air, the Sunday Market, and the no fuss life. It is amazing how calm one can be in a place where nothing is a big deal and things just work out. What have you missed here? The Dog, Amazon, Costco (besides our friends and family). Who in the family could be happy living there forever?